Freedom and security are two things that we strive to have for ourselves and our loved ones, but it’s hard to feel both secure and free when many wired surveillance systems leave you confined to one viewing area. The PHOENIX1 is the answer to this issue. The PHOENIX1 is an easy to use, wireless, color handheld monitoring system which can be used indoors or outdoors to keep your family and belongings safe and secure. 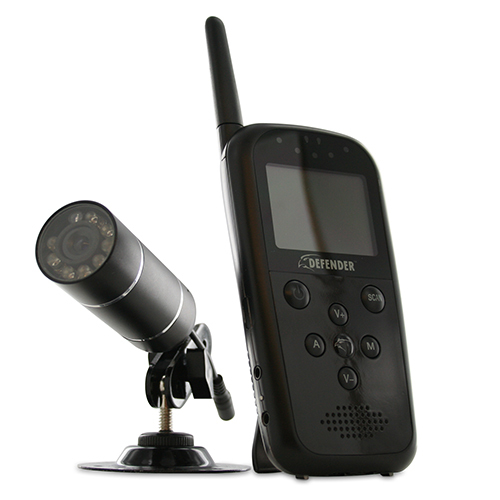 Audio and video is sent wirelessly to the handheld monitor, which has a 2.25” color LCD screen for crystal clear viewing of your camera’s video without need for any wiring. To protect your privacy and avoid interference, the PHOENIX1 wirelessly transmits both audio and video on a different frequency than the overcrowded 2.4GHz, allowing you to view your video on the monitor without worry of interference or interception. Keep watch over your belongings and loved ones without a bulky system or wiring with the PHOENIX1! This system is extremely user-friendly and you can have it up and running in a matter of minutes with no need to hire a professional installer. It’s as easy as turning on the handheld monitor and placing the camera in the area you wish to monitor. PHOENIX1’s Clear Signal Technology is different from many other monitoring systems that experience interference from other wireless signals. Other wireless devices have interference issues and concerns over interception and privacy. Audio and video are transmitted over the 900MHz frequency, giving you a clear signal. The PHOENIX1 will not receive interference from any of the standardized 2.4GHz wireless networks, routers, phones, devices, or access points within your home or business. Audio and video signals are both able to pass through floors and walls within the 75 foot optimum range. The PHOENIX1 is as portable and versatile as you need it to be because the system’s camera utilizes the 900MHz frequency. There is no need to connect any wires from the camera to the monitor. The monitor is powered by a built-in rechargeable lithium battery and the camera is capable of running on battery power, making this system able to operate completely wireless. You can carry the LCD monitor with you as you move from your office to warehouse, or move the camera from room to room as your children play. The versatile PHOENIX1 gives you the ability to monitor your valuables or loved ones, no matter how active they are! The included indoor/outdoor color camera provides you with clear, crisp, and enhanced video at 360 TV lines of resolution. It allows you to better distinguish facial features, which can help in the positive identification of individuals. Knowing what is going on outside of your business or home is important to you. Place the camera in your store or outside your home to increase your security perimeter. Each camera is built with professional grade aluminum housing and designed to function in both indoor and outdoor situations without deterioration or rusting. Continuous Security – Day and Night! You can’t always be watching video, so we added the power of sound to this system. A built-in microphone in the camera lets you hear everything that’s happening in your monitoring location. You can be anywhere in your home and still hear cries for help. Another safety feature of the PHOENIX1 is the audible alarm feature. Simply set the monitor to alert you with an audible beep when it detects sound above an adjustable preset level. When two cameras are connected and sound is detected on one of the cameras, you can set the monitor to automatically display video from the camera that detects sound. You can double the range of your security system by adding a second camera. The PHOENIX1 is capable of supporting 2 cameras so you can monitor 2 important areas. The PHOENIX1 easily connects to your TV or monitor with the included RCA wire. Allow the PHOENIX1 to be the eyes and ears of your property with the system’s audio and video transmission. Simply connect the receiver to a VCR or DVR for recording and you will be able to see what the cameras see when you aren’t at home. You no longer need to wonder what you’ve been missing in your home or office with the PHOENIX1.